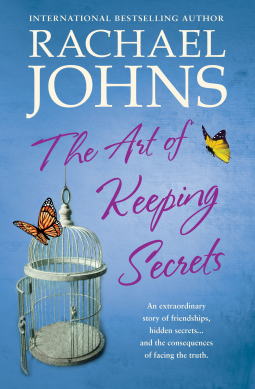 Racheal Johns has written an engaging and thought provoking book about three friends and the secrets they have unshared. They are really very involved in each others lives, yet they don’t know everything that is going on for each of them – yet. Three women – Felicity married to Seb, with two children, Zoe about to be married and a seventeen year old son. Seb is a loving attentive husband, the other two women Emma and Neve somewhat envy the happy married life. But what they don’t know is that something is going down to change the relationship Felicity and Seb have. In spite of the love between them, it may not be enough. Emma is a divorced women coping with three teenage children and an ex husband and his young wife that has replaced her. Max gives the children everything, and Emma struggles to work and pay the way of herself and the children with little support from the ex. And what is worse the stress is getting to her and headaches are plaguing every step she takes. Neve, has one son – Will. She has brought Will up alone, and now he wants to know who is father is. The trouble is she has told Will his father did not want him, however now she is faced with having to face up to the man she has never told that he has a son. She is at risk of losing her son when he discovers the truth. In turn the story focuses on each woman and the struggles she faces. However they are all very much there for each other, in spite of some differences of opinions. And eventually secrets will out. And when it is tough going they are there for each other. The theme of friendship is strong. Each woman must find her way forward for her, while friends are there for you, in the end each must take those brave steps on their own. While I don’t want to give the plot away, other than to say its very on point, I’ll just say that I was so delighted to see Felicity finally take the heartbreaking step that would ensure she stay true to herself. Kudos to Rachael Johns for this book, exploring a topic that has only recently come to the fore a lot more. Not telling what though, that would be to spoil the finding out. A friendship theme sounds good. Thanks for sharing, and I hope your week has been good. This sounds like my kind of book. I like stories where there are multiple characters and who are intertwined. I've been more and more drawn to friendship type books lately and this looks really good. I love secrets and complicated relationships like this! Now you've got me wondering! Oh, yes, I love secrets! Watching them come out is so enticing…lol. Thanks for sharing. OOh I love friends w/secrets tropes. Thanks Kathryn! Your review has me placing it on my GR to read list. Thanks for that because I hadn't heard of it before.